One of my colleagues moved to Hamburg, Germany this past weekend. He gave me his smoker before leaving, and I used it for the first time this past weekend. I enjoyed it a lot more than I expected. I started preparing Wednesday evening – got an 8 lb pork shoulder and applied a rub to it. On Saturday I started warming it up around 7am and had the meat going by 9am, where it cooked for 8 hours. Afterwards the meat rested for an hour, and then we made delicious pulled pork sandwiches out of it. The anticipation is amazing. I daydreamed about this for several days, and was super-excited to check on it all day Saturday. It smells so good. I sort of liked my clothes and hair smelling like smoke, it reminded me of what was going on in my backyard. It was low-stress. Didn’t require constant attention. I checke dthe temperature and swapped chips every 1 to 1.5 hours. Was able to go out to the farmers’ market, grab lunch, get a haircut, go for a walk to get some ice cream all throughout the day. 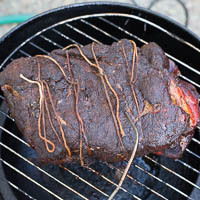 It felt like even if I missed checking on something for 30 minutes, nothing terrible was going to happen – as long as the smoker temperature stayed below 250F, something tender and delicious would emerge from the smoker. My biggest worry was that some of the wood chips would ignite and make it too warm. Things didn’t work out perfectly. I think it could have cooked for another hour or two (got up to 175F internally). The meat wasn’t as smoky as I had hoped, I’m pretty sure that’s because I wrapped my foil packets of wood chips too tightly. So I’m definitely looking forward to doing it again soon, had to restrain myself from firing it up again today. I’m a bit embarrassed to say that after all these years I haven’t really had a go-to hamburger recipe. I think I finally found one – this one is a bit more forgiving than others since the burger stays tender even when you cook it to a well-done temperature. 2. Meanwhile, mash bread and milk in large bowl with fork until homogeneous (you should have about 1/4 cup). Stir in salt, pepper, garlic, and steak sauce. 4. Lightly dip wad of paper towels in vegetable oil; holding wad with tongs, wipe cooking grate. Grill burgers on hot side of grill, covered, until well seared on first side, 2 to 4 minutes. Using wide metal spatula, flip burgers and continue grilling, about 3 minutes for medium-well or 4 minutes for well-done. 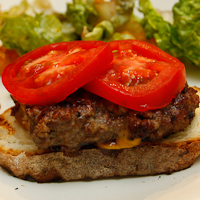 Distribute equal portions of cheese (if using) on burgers about 2 minutes before they reach desired doneness, covering burgers with disposable aluminum pan to melt cheese. While burgers grill, toast buns on cooler side of grill, rotating buns as necessary to toast evenly. Serve burgers on toasted buns. It’s been a while since I posted something meaty. I was inspired by our Costco run to try out this recipe (only made a half-portion). Got a really nice crust going on it. I could have been a bit more patient with the sauce, but I was getting hungry. 1. Adjust oven rack to lower-middle position, place shallow roasting pan or jelly-roll pan on oven rack, and heat oven to 425 degrees. 2. Season lamb with salt and pepper. Heat oil in heavy-bottomed 12-inch skillet over high heat until shimmering. Place racks of lamb in skillet, meat-side down in the center of the pan, with ribs facing outwards; cook until well-browned and nice crust has formed on surface, about 4 minutes. Using tongs, stand racks up in skillet, leaning them against each other to brown the bottoms; cook until bottom sides have browned, about 2 minutes longer. 3. Transfer lamb to preheated roasting pan. (Begin pan sauce). Roast until instant-read thermometer inserted into the center of each rack registers about 135 degrees, 12 to 15 minutes, depending on size of rack. Cover meat loosely with foil and let rest about 10 minutes. Carve, slicing between each rib into individual chops, and serve immediately with the sauce. 4. Pour off all but 1 1/2 tablespoons fat from skillet used to brown lamb; place skillet over medium heat. Sauté shallots until softened, about 1 minute. 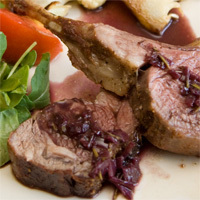 Add red wine and rosemary; increase heat to medium-high and simmer until dark and syrupy, about 7 minutes. Add chicken broth; simmer until reduced to about 3/4 cup, about 5 minutes longer. Off heat, swirl in butter; season to taste with salt and pepper, and serve with lamb.